Round-trip international airfare from New York City to Poland. A leisurely walking tour of old town Warsaw with a professional guide. An optional Pierogi Cooking Lesson, including a Folk Polish Dance workshop. A trip to the town of Lowicz, a picturesque city famous for its traditional Polish art. A visit to the open air museum with an opportunity to participate in a special folk art workshop. Shopping opportunities in local markets. A tour of Zalipie the painted village. A drive to a Istebna a small village to see the largest piece of lace in the world. A visit to the stained glass museum with an opportunity to participate in a glass stain workshop. An optional trip to the incredible Wieliczka Salt Mines. Once believed to be one of the most beautiful cities in the world, it was left in ruins after World War II. Now Warsaw has become one of Europe&apos;s most dynamic metropolitan cities, ranked as one of the most liveable cities in Europe. It has also become a major international tourist destination, along with an important hub for culture, politics and economy. There are many things to enjoy in this beautiful city from it&apos;s parks, Old Town, the iconic Market Square, the sounds of Frédéric Chopin, palaces and the amazing history of the Jewish culture and history that resonates through time. Krakow is the second largest city in Poland and also one of the oldest, the city dates back to the 7th century. Traditionally Krakow is one of the leading centers of Polish academic, cultural, and artistic life, also an important economic hub. This once capital of Poland was named the European Capital of Culture in 2000, and as such is a major attraction for tourists. The Old Town district alone is home to about six thousand historic sites and more than two million works of art. The most popular landmarks include the Main Market Square, St. Mary&apos;s Basilica, the Sukiennice Cloth Hall, Wawel Castle, and the National Art Museum which is just one of the over 25 museums and public art galleries throughout the city. Luckily Krakow escaped from most of the destruction that many other parts of Poland suffed in the 20th century wars. Because of this, the rich history of Krakow can be seen today and provides a showcase for it&apos; historic styles of architecture which are easily recognizable throughout the city as you travel outward from the center. Lowicz is one of the oldest towns in Poland, first mentioned as early as 1136 in historical texts. Lowicz boasts the only market square in Poland, and only one of three in Europe to be in the shape of a triangle. One thing not to be missed while visiting is the Cathedral Basilica with it&apos;s splendid organs along with treasury and library. Throughout this small town there are nearly one hundred objects included in the national register of monuments. The folk costumes of Lowicz are considered the most beautiful in Poland, for women it is decorated with colorful embroidery, usually of roses and other small flowers surrounded by leaves and a scarf as a headdress. Lowicz is also popular for it&apos;s paper cutting craft, Wycinanki. This art form can take on various shapes of stars, circles, trees, rosettes, lilies, and more. A small ancient village in South-Eastern Poland, Zalipie, is one of the country&apos;s most beautiful attractions. This is due to its small wooden cottages, which are painted in the most vibrant colors. 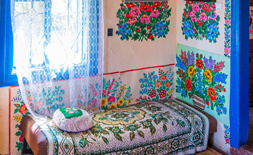 This lovely tradition started with more than a century ago, when every single female resident in Zalipie begun to paint her home with floral motives, as she wanted to cover up some particular faults. Zalipie can be seen as a massive painting, full of color, life and history. The whole village is painted. Even the dog&apos;s cages or old fountains, not to mention fences, windows and interior walls. Istebna is a village in southern Poland, near the borders of the Czech Republic and Slovakia. This quaint town boasts the largest piece of world made by five women over the course of 5 months, consisting of over 50km of thread, eight throusand motifs, and weighing over 5kg. This impressive piece of art is over five meters in diameter.